Fibre or cloth with natural oil or wax removed chemically. Because of absorbent nature, used for surgical purposes. Very fine muslin of cotton imported from India at the end of the 17th century. 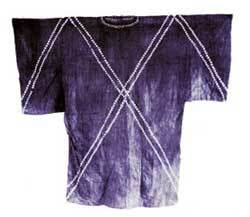 Cotton cloth produced in the Asante Kingdom, Ghana, Africa. See "Art of the Asante Kingdom"
Originally made of linen for airplane wings. Close even texture. Since the war made of cotton in different weights and colors. Used chiefly in shirts. Weave plain. (alaca) "Originally a striped clothe of mixed cotton-and-silk, commonly red and white or blue and white. Gujurat Alachas usually contained a higher proportion of cotton than Bengal cloth of the same name which someone led to their being classified as calicoes.... Alachas made on the Coromandel coast were similary stripes but made entirely of cotton." Mixed wool and silk fabric used primarily for men's clothing in 18th century England. A light weight wool fabric with crepy surface, due to twist of yarns. Piece-dyed, usually in light colors. Launders well. A variety of albatross 44" wide is called Cripe Egypta, a trade name. Uses: dresses, negligees and infant's wear. Weave—plain. Width, 36". Fr. Syns. : modes (Fr.) ; fillings, lead-works (Eng.). Fancy open stitches introduced in spaces in the pattern of both bobbin- and needle-point lace. See silk and cotton fabrics. Cotton cloth produced in Benin, Africa, woven on either the vertical loom or the treadle loom. allada cloth, mid 17th c.
Fine cloth of mixed cotton and silk imported from India by the East India Company in the XVIIth c.
Cloth of double twill weave running diagonally from left to right. Originally made in black for mourning wear. 1. 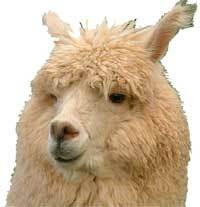 An animal somewhat like the Angora goat, but smaller, native to South America. 2. Name of a fabric originally made of this fibre. Similar to brilliantine and mohair. Smooth, wiry with cotton warp and worsted filling (alpaca, mohair or any lustrous wool slightly twisted). Wears well, sheds dust. Uses: linings, men's summer suits and office coats, women's dresses (when in vogue). . Rayon and cotton fabric called alpaca because of its wiry nature. The English East India Company established a textile factory in Patna for trading in calico and silk. Amberty or ambertee was woven there. A kind of fabric with fancy pattern originally made in Amiens, France. 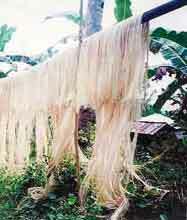 Species of wild silk produced in Africa. Light wool fabric manufactured in the XIX century. The name probably from angora. See cashmere shawls. Drapery fabric with designs woven on a rep foundation, or a figure weave. Plain or mixed colors usually of cotton. Uses: couch covers, portieres. Weave —-Jacquard. Width, 50". 2. Silk fabric, closely woven with small pebbly pattern which suggests chain armor. A fabric made of wool and silk mixed, sometimes of mohair and cotton at the end of the 17th century. Raw silk fiber of Persia. Ardasse was used sometimes in Lyon in the early 18th century. The needle-point lace made at Argentan is the only needle-point lace with a net ground besides Alencon which has ever been made in France. It is probable that factories at both places were established in the reign of Louis XIV. by Colbert, but its name does not appear in the ordinance. A kind of silk taffeta made in Lyon in the 17th and 18th century. The name is derived from the French Armoisin. It is a strong make of thick plain black corded silk, a kind of taffeta, employed for scholastic gowns. Name derived from French "Armoires" meaning coat-of-arms. A stiff, rich looking silk, usually black. Uses: cravats, trimmings, facings for men's dress coats. Weave-fancy, called barathea. Width, 20", 36". Distinguished from regular bed ticking by its printed design. Often a floral pattern in a stripe. A tough firm cloth. Uses: mattresses and pillow covers, sometimes as cretonne. Weave—Satin or twill. Width, 36". A substitute for leather made by coating a cotton fabric with a nitro-cellulose preparation and embossing the surface to imitate leather. Various effects produced by kind of fabric foundation and the color and finish of surface. A good grade of manufactured leather is more durable than a poor grade of split leather. Sold under trade names as Pantasote, Leatkerwove, Fabrikoid, Zapon, etc. Uses: upholstering, suit cases, millinery and dress trimmings. Fireproof fibre of mineral origin. Spun with cotton and woven. Cotton later burned away. Used for theater curtains and firemen's gloves. From Assissi in Italy. Embroidery in which the designs themselves are left unworked and stand out in white from a solid background worked in cross_stitches. Traditionally, Assisi embroidery was rarely executed in cross-stitch, but most often in long-armed cross-stitch. Wool coating made to imitate Astrachan or Karakul fur. Foundation cloth, knitted or woven of cotton or wool. Curly pile of mohair yarn slightly twisted. May resemble the close curl of Persian lamb fur. Good quality. Wears well. Uses: coats for men, women and children, caps, muffs, trimmings. Weave—pile (may have knit back). Width, 52". Type of silk used in Turkey in the 16th c. Atlas was commonly used as facing on kaftans. In "Textile in America" Atlas is a silk-sattin manufactured in the East Indies. Balinese ceremonial cloth with continuous warp, blue and white stripes. (Fr. pr. o-bus-sone). 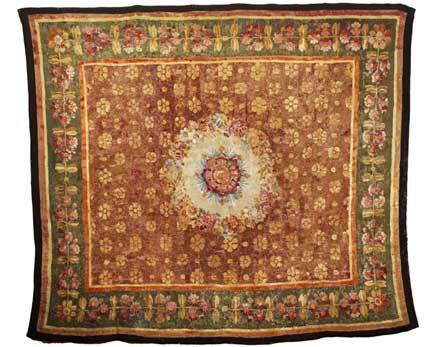 Carpet or Tapestry made in Aubusson, France on hand looms. Aubusson is situated , in the upper valley of the Creuse River in central France. The first Aubusson were produced by Flemish weavers who left Flanders in the second half of the 16th c.
Pile carpet named for town in England where first made. The manufactory was established by Thomas Whitty in 1755. In 1835 the manufactoey was moved to Wilton. Duck woven with stripes (yarn dyed) for awnings and lawn umbrellas. May be used for couch covers and chair seats. 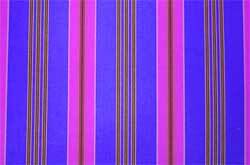 Awning stripe be yarn dyed or printed.